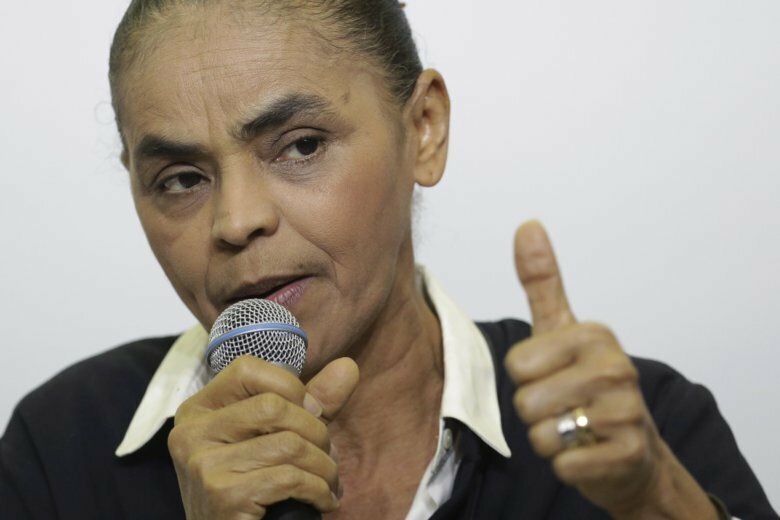 RIO DE JANEIRO (AP) — Marina Silva, a leading presidential candidate in Brazil, said Friday that her former boss, jailed ex-President Luiz Inacio Lula da Silva, should be barred from running for office. Silva, a former senator and environmental minister, also criticized the military intervention in the state of Rio de Janeiro and promised that if elected she would push to institute presidential term limits so leaders were focused on what was best for the country, not on getting re-elected. Silva made the comments during an hour-long question and answer session with foreign journalists. When asked about da Silva, who in April began serving a 12-year sentence for a corruption conviction, Silva said Brazil’s Clean Slate law was clear. It prohibits a convict whose appeal has been upheld from running for office. Da Silva’s appeal was upheld in January. Despite being jailed, da Silva is the front-runner in the polls and insists he still plans to run. Silva gained prominence as environmental minister during many of the years da Silva was in office between 2003 and 2010. Silva since broke with da Silva’s Workers’ Party, and made competitive bids for the presidency in 2010 and 2014. Some critics argue that she has done little the last 10 years except run for office. When asked to address that, Silva said if she had been in government these last years the “criticism could be the opposite,” that she wasn’t truly independent. She argued that forming a political party, developing policy and speaking across the country and internationally was a way to contribute to the public good. Silva is currently polling third behind da Silva and Jair Bolsonaro, a congressman and former army captain who speaks nostalgically about Brazil’s 1964-1985 military dictatorship. A dramatic personal story helps her connect well with people in one of the world’s most unequal countries when it comes to education and income distribution. Born into a poor family in the northwestern state of Acre, Silva often went hungry as a child and didn’t learn to read and write until her teens. However, during previous elections, and so far this cycle, she has struggled to define herself beyond environmental policy. On Friday, when asked about some of the most pressing issues facing Brazil, from calls to overhaul a bloated pension system to whether state oil company Petrobras should subsidize fuel prices in the country, her answers were heavy on phrases like “programmatic” and addressing “structural problems” and nearly devoid of details. She argued that Brazil needed to move beyond coalition politics in which large parties made deals with each other that were in their own interests and not the population. She said addressing violence, which voters say is a central concern, would take long-term planning to improve education and health care. She was critical of military intervention in Rio. After a wave of violence during Carnival in February, President Michel Temer ordered the military to take over security in the state.